As K-Pop continues to take the world by storm, the Litecoin Foundation today announced a partnership with K-Pop concert production company, C&U Entertainment Global, to promote Litecoin (LTC) through the upcoming Feel the K-Pop concert. 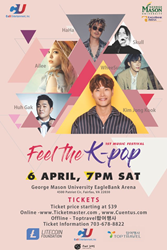 Taking place on April 6th at EagleBank Arena on the campus of George Mason University, the concert features K-Pop sensations Kim Jong Kook and Ailee, as well as several other popular artists in the genre, including WheeSung, HaHa, Huh Gak, and Skull. As part of the collaboration, the Litecoin Foundation has reserved ULTRA VIP tickets that will be exclusively available to purchase using Litecoin. These tickets, which will offer the best seating and experience in the arena, will soon be available on the Litecoin Foundation’s website. The Litecoin Foundation will also have several members on site during the event to help educate concert goers on the power of Litecoin. K-Pop has become a global phenomenon with a captive audience of millions around the world. The buzz it commands is immense, garnering 5.3 billion tweets in 2018 alone, continuing to dominate the Billboard Social 50 chart, and even taking this year’s Grammys by storm. This kind of attention has enabled K-Pop to transcend the Asian market, as evident in the increase in top K-Pop stars announcing US tours. South Korea, the home of K-Pop, also happens to be a hotbed for cryptocurrency. The country of 50 million has historically shown a high level of technology adoption and possess an infrastructure and framework that has allowed it to cultivate a thriving cryptocurrency ecosystem. South Korea has been a microcosm of the broader Asian cryptocurrency market, which has played a major role in global activity. In fact, past research has reported that Asian investors account for over 75% of daily cryptocurrency trades. Feel the K-Pop is the first of potentially several events as part of the collaboration between the Litecoin Foundation and C&U Entertainment. The organizations are actively working towards a series of groundbreaking events that will blend the power of K-Pop and cryptocurrency, and support the mission to bring Litecoin to the masses. Tickets to the event will go on sale starting tomorrow Wednesday, February 27th at Ticketmaster.com. Stay tuned for updates from the Litecoin Foundation on the sale of the VIP tickets! Created in 2011, Litecoin (LTC) is a cryptocurrency built on the premise of quick confirmation times and low transaction fees. These features, combined with the increasing desire to have greater control over one’s finances, are quickly propelling Litecoin towards becoming the new global payments standard for consumers and businesses worldwide. For more information, visit http://www.Litecoin.com. The Litecoin Foundation is a non-profit organization whose mission is to advance Litecoin for the good of society by developing and promoting state-of-the-art blockchain technologies. Registered in Singapore, the Foundation is comprised of fulltime and volunteer support from around the globe. For more information, visit https://litecoin-foundation.org and find us on twitter at @LTCFoundation. C&U Entertainment is a leader in Kpop live entertainment in the Washington D.C. area. At C&U, our mission and passion is to showcase the top talents from Korea on the world stage. For more information, visit http://www.cuentus.com and find us on Twitter at @CUEntGlobal.